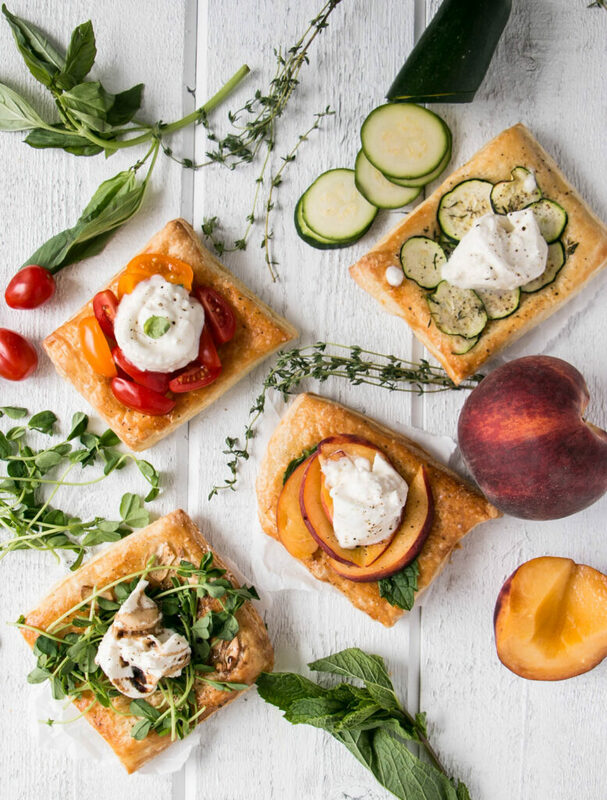 Burrata and puff pastry; two of my favourite ingredients collide for one amazing tart recipe. Burrata Tarts are crazy scrumptious and I’ve paired the burrata with four different complimentary flavours to highlight this gooey and creamy cheese. Burrata is a soft fresh mozzarella which has a firm exterior with cream and mozzarella on the interior. The contrasting textures highlights the interior’s soft and creamy texture that’s unbeatable. If burrata’s not in the budget or unavailable then fresh mozzarella torn into pieces also works well. Burrata is creamier than fresh mozzarella and goes astounding well with a lot of produce.